After soaking up the super amplified rays from the sun in Destin, Florida, my husband, kids, dad and step-mom, went goo goo over the .18 cent bean soup from McGuires Pub. Yes, I meant to write .18 cents! The soup was very thick and creamy. My version was not the same, but I liked it better. It’s somewhat of a cross between bean soup and potato soup. YUM! Place beans in a large bowl and cover with water. Allow to soak overnight; Drain water and set aside. In a large stock pot, drizzle 2-3 tablespoons of olive oil; Sauté carrots, celery and onion in oil for 10 minutes – long enough to brown and develop flavors. 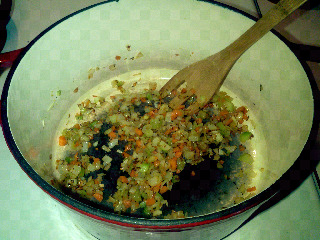 Stir in garlic and cook 2 minutes. 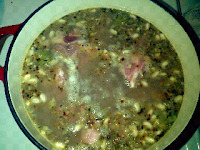 Pour in water; add salt, pepper, nutmeg, beans, and ham shank. Bring to a low simmer; cover; cook for 4 hours. When beans are tender, mash 1/3 beans, using a potato masher, to make a creamier texture. Mix in mashed potatoes or potato flakes and simmer until thickened and creamy. Serve. *Use a fork or knife to poke a few holes in potatoes. Place in microwave and cook for 5-10 minutes or until soft. Remove from microwave and let cool. Peel skin and mash potatoes; mixing in broth from the soup to make it creamy. Once creamy add to soup and stir well. **Potato flakes can be substituted for mashed potatoes. ***DH likes this with more whole beans. I prefer the beans mashed.